When you put your kids on a bus with a stranger, you hope that they have enough sense to at least follow the rules of the road. 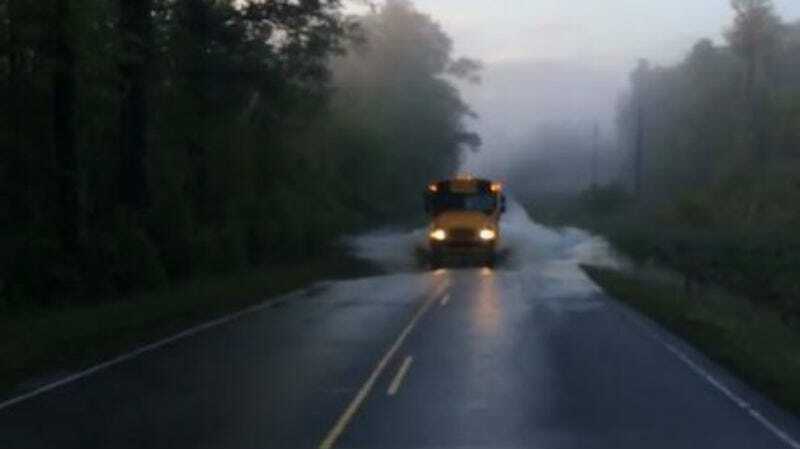 But according to local station WECT, school bus driver in North Carolina was fired for driving a bus full of children through a flooded road that was closed by local authorities. WECT reports that a spokesperson for the Brunswick County School district said they recently fired bus driver Marsha McMillan, 49, for failure to follow standard protocol when drove her bus around road-closure barricades and through a flooded portion of the street. In the video below, you can see the bus stopped right before the flooded area then traversing through with water almost up to the headlights. “The barricades were butted together so she really had to work at it to get through but she was bound and determined,” Felker said. Brunswick County Schools could not confirm that McMillian moved the barricades, but said there was sufficient evidence to fire her. A North Carolina Department of Transportation official told WECT that the road was closed on Monday afternoon due to heavy rains and flooding and remained closed on Tuesday morning when McMillan was driving her route to school. All the children arrived safely, but the school district told the station that doesn’t give the driver a free pass to ignore a road closure, and therefore, the driver must face disciplinary action. A spokesperson for the school district called the driver’s actions “inexcusable” and told WECT transportation officials will remind all bus drivers of important safety protocols to prevent something like that from happening again.